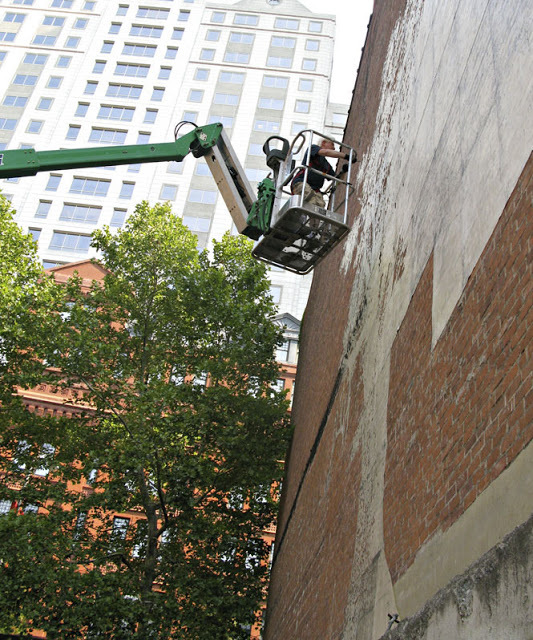 Connecticut’s Department of Economic and Community Development is the mastermind behind City Canvas, a one-time, million-dollar initiative to bring mural-based public art created by Connecticut artists into downtown spaces throughout the state. Participating cities include Bridgeport, Hartford, New Britain, New London, Stamford, Torrington, and Waterbury. Adam Niklewicz, whose proposal was selected for a site in Hartford, recently spoke with Two Coats contributor, Joe Bun Keo. 1. JOE BUN KEO: Adam, I’ve met you on a few occasions, most recently at David Borawski‘s pop-up art space ATOM space in Downtown Hartford, where we were in a show, NOW ON together. ADAM NIKLEWICZ: Criticism? No, not really. I love the measure of freedom the kind of art both of us engage in provides. From piece to piece your art can look dramatically different and what ties it all together is the conceptual component. The viewers understand and appreciate it. 2. JBK: Much of your work pulls from your experiences with displacement and transience. You’re a Polish-born American. There’s a tug-o-war of culture and identity. I have a similar situation where I was born in America, but my ethnicity is Cambodian, but I speak Thai and English. I’m being pulled three ways in regards to cultural identity. Are you looking to find resolution by creating works that focus on this specific issue? Is your work more about you dealing with the situation and not necessarily trying to find an answer? How do you describe your handling of your Polish-American heritage? AN: On one hand, there’s the visual vocabulary of my Polish childhood, on the other – the American pop-cultural and commercial iconography. The two clash and blend together (there’s a bit of smoke) and all this occasionally produces some creative leaven. I often base my art on quirky, ethnic, folkish facts, but I do hope I’m able to distill these facts into works with universal appeal. 3. JBK: The Charter Oak water mural was created using a paint where the image is activated by water. The Charter Oak is a historic symbol of Connecticut’s revolutionary spirit. Hartford, being its capital, is looking for a revival. 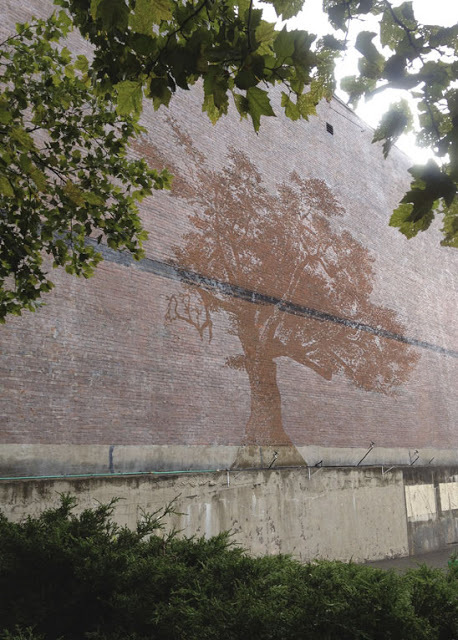 Like invisible ink that is activated by other means, would you say this mural acts as a metaphor for the capital city and the state in the sense that the two have so much dormant/untapped potential, that it only takes the simple essential elements to accentuate it and let it be known? AN: I welcome and like your interpretation! I trust good art is capacious and provides room for many interpretations (even contradictory ones). 4JBK: Paint is pigment and a vehicle. Public art is visuals and an open public audience. You need the other to complete the intention. You said “public art should embrace the existing environment and work to enrich reality.” You made a public brick facade in Downtown Hartford your canvas, but I can’t help but notice that the wall isn’t as public as a well-lit billboard on the highway or a large sculpture on a park green. You’d have to be a little more observant than usual if walking by the alleyway across from bin228 on Pearl Street to notice it. The accompanying “Walking Around the Tree” projection can only be seen at night on the AT&T building. Can this still be considered a cohesive public art project, when the view has some limitations? Does it fall into situational privacy? It seems to walk the line of what really distinguishes public from private. AN: We worked with what was available to us. In fact, very few walls could host the idea. I trust that the proximity of the AT&T façade (where the projection takes place) to the brick wall (which sports the water mural) makes for a coherent whole. And don’t start me on ‘a well-lit billboard’; a public art project is not an advertising campaign. Advertising campaigns create slick, bogus reality, and public art project embraces the existing, imperfect one. 5. JBK: The blog’s name is “Two Coats of Paint.” The first coat is usually a primer and the second seals the deal. With your body of work, this current project, and your general overall approach to art-making what importance does the concept of layers, levels, trials and overlapping play? The intention of creating a refined piece is different for everyone, but is there an inherent goal of perfection the first time around or should every artist accept that failures accumulate to eventually resemble something close to perfection? AN: An artist must be accepting of his/her inherent imperfection! Only then, can the artist be open to chance, which is a condition for something fresh, surprising, real to come his/her way. 6. JBK: What’s next for Adam Niklewicz? What are your current and upcoming projects? You’re teaching at Central Connecticut State University. What are you teaching and describe how that is contributing to your practice. What creative endeavors should we all look forward to from you? Fill us in! AN: It’s my dirty secret that I learn from my students. At the moment, I’m showing 12 prints and 2 sculptures at a solo show in NYC (at Polish Institute of Arts and Sciences, 208 E. 30th St.). In February next year, I should be in a group show at Hudson Valley Center for Contemporary Art in Peekskill, NY. What I need most now though, is to regain my equilibrium (the project in Hartford lasted several months and was all-consuming). It will allow me to plunge into developing new body of work. Thanks for giving us insider's access to this work of art. We especially liked how the conversation turned to the difference between advertisements and public art. 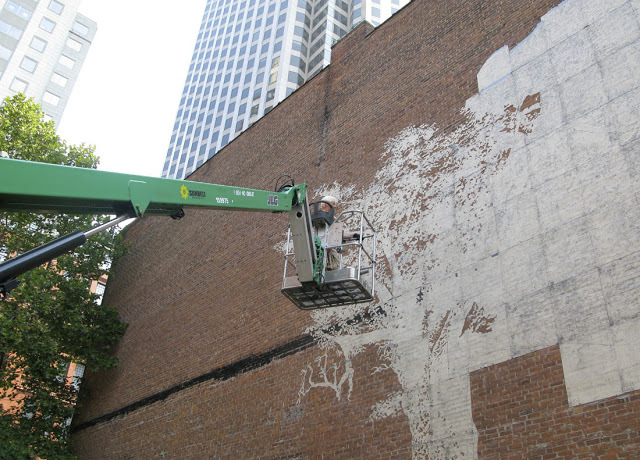 We've linked this post in our blog to encourage our readers to give it and the mural a nice slow look!